OUR FOSTERS ARE DEDICATED TO HOUSING PIGGIES UNTIL WE FIND THEM A FOREVER HOME. Fostering a rescue piggy means that you agree to take an animal(s) into your home and care for him or her until we can find them a loving forever home. We are always in need of more fosters. Some of our piggies are saved directly from animal shelters where they are at risk of being euthanized, while others come to us directly from undesirable living conditions. 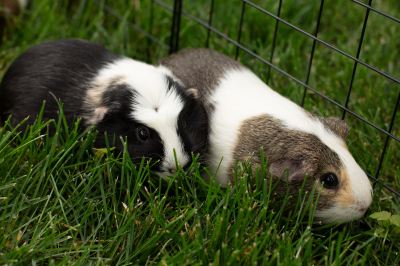 These wonderful piggies are in need of foster homes to show them what it means to feel loved! Helping a rescue animal find their forever home is a priceless experience that we hope you'll consider partaking in! WHAT WILL BE EXPECTED OF ME AS A FOSTER? All items you need to care for your foster pig (cage, food, bedding, water bottle, hideaways, etc.) will be provided by Piggy Haven, as well as any vet expenses they may have. The most important part of your job will be to help introduce your foster animal to a comfortable home environment, and to give him/her some socialization and lots of love! Please review our fostering FAQ below and reach out to us with any other questions you may have! WHO PAYS THE MEDICAL EXPENSES OF MY FOSTER PIGGY? WHAT HAPPENS AFTER I DECIDE I WANT TO FOSTER? Yes. All supplies you will need to care for your foster piggy will be provided by Piggy Haven. We will bring these to you at the time we drop off your foster animal. If your foster pig requires any veterinary care or medications, Piggy Haven will cover any and all medical expenses for that animal. Contact us if you'd like to apply to be a foster with us. We will send you a form to sign with additional details, and, if we move forward, will conduct a home visit to meet you and make sure your home is suitable for a fostering! HOW LONG DOES IT TAKE TO FIND A FOREVER HOME? HOW MUCH SPACE DO I NEED IN MY HOME IN ORDER TO FOSTER? It is very hard to give an average time that an animal is in foster care. Sometimes animals are adopted relatively quickly, while other times it can take several months. We cannot make any guarantee as to how long they will be in your home. We recommend that you plan to commit to the animal you are fostering until a forever family is found, but we are also able to take animals back if you need to stop fostering for any reason. Depending on the amount of piggies you are able to foster, you will be provided with either a 28"x42" or 28"x56" cage. We are always in need of more fosters! Some of our piggies are saved directly from animal shelters where they are at risk of being euthanized, while others come to us directly from undesirable living conditions. Fostering allows space to be freed up in order for us to rescue more animals. Fostering directly saves lives and is more important than we can ever express!